Now that our crowdfunding campaign on Indiegogo is closed, we would like to give you an update on how we will proceed from now on. First of all we would like to thank the hundreds of people who shared our crowdfunding on social media and among their friends, especially the dozens who have already contributed in our crowdfunding campaign until January 22. The total amount collected is: 2.515,00€ – 125,75€ (Indiegogo platform fee) = 2.389,25€ net amount collected. This covers a rough 14% of the documentary expenses which is, of course , very important. 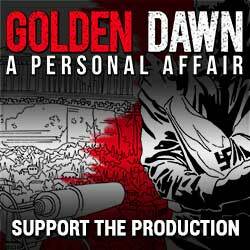 Since a significant sum of expenses still remains, and we think it’s important that many people who put a lot of labour into this film – filming, writing, translating, editing, illustrating, etc – will get paid for that labour, we will continue receiving contributions on our “Support the Production” page, until the budget is covered. We will keep tracking contributions and updating the total sum collected. At this point, we plan for a public release on April. Meanwhile, we anticipate decisions on selection of the film by some fistivals around the world. We will keep you posted, of course, on any news regarding festival selections and the final public release date. UNFOLLOW magazine: a Greek, monthly, independent magazine on politics and journalism. Thank you all for your interest in the film. We hope that it will be a contribution in documenting a very real issue with very real repercussions: the rise of neo-fascism in Europe.